Today is my four year mark with VCE. This is also my first net new blog post using GitHub Pages. I’ve decided that I will be pushing updates in this way. So far, GitHub Pages is slightly easier than keeping up with Octopress on a virtual server which was easier than keeping up with WordPress on a virtual server which was easier than keeping up with a dedicated physical server in my own private managed colo. I’ve evolved as have the tools. This can all change. That’s kind of the point. Given enough time I’ll eventually be migrating over my content from fudge.org (bit by bit). My thinking is that GitHub Pages provides an entirely hosted approach to my content and rendering of that content via redcarpet markdown. While I’ll still have a local repo, I’m not planning on chewing local CPU to render with Octopress / Jeckyll only to push updates to what is ostensibly a flat file server on the Interwebs. Simpler. Easier. I can even pen from a browser again. My next version of this blog will probably involve something relating to Pivotal Cloud Foundry and Pivotal Web Services in terms of the technology stack. We shall see. It’s not like a blog is a heavy app but I think there are some interesting things I could do if I ever depart from flat file rendering. Maybe. Oh yes, VCE. Let’s talk about VCE. Well, that’s the thing isn’t it. One doesn’t simply talk about VCE and our very secretive ways. These are my opinions. I’ll say that a lot in this post or at least twice. When I see something factual to link to I’ll do so but what follows are my opinions. Did I mention that these are my opinions? It’s telling that VCE has been compared to Apple by some. That secrecy has served VCE well… in my opinion. So in the year since my last update I can say that VCE has publicly disclosed that we did in excess of 1 Bilion dollars in revenue and achieved in excess of 1.8 Billion dollars in run rate. Even just typing in those numbers is slightly unnerving. GULP! Fun fact: I actually maintain a summary listing of all of the gloom and doom predictions that goes all the way back to 2009. It’s 2014 and looking back to see just how fundamentally flawed and flat out wrong tech journalism has become (in certain segments) is telling. It’s like a scrapbook of fail… in my opinion. Since my yearly updates take place far before our investors produce their own reports and numbers to show the market what is truly up… I’ll just have to say that I’ve been very busy… in my opinion. Moving to Las Vegas was exactly what I needed to do for the type of trips I’ve been taking over the past 12 months. So many meetings with prospects that are now VCE customers. So many trips to meet with our partners to build the alliances that will help propel VCE in ways I could only previously imagine. Considering the massive global expansions in 2012 that took me to a dozen different contries I’ve was fortunate to primarily stay domestic for 2013. Yet, I’ve put in the same or more miles domestically. For 2014 even though I’ve left the country a few times it has been within this hemisphere. Of course, I have no idea what 2015 will hold… but I will be busy… in my opinion. It varies from day to day. Sometimes I am considering research and development topics. Sometimes I am looking at the wider competitive landscape and how it evolves. Sometimes I am meeting and exploring wider relationships formalized through alliances and partnerships. And other times… I am meeting with a lot of customers and even more prospects that become our customers. The big trade shows for me have been EMC World, Cisco Live, and VMworld. In the middle of those I’ve been able to attend a few more events but those were typically related to alliance activities and I can’t even talk much about those here. I’ll just say they were awesome… in my opinion. When I am asked what kind of exposure I’ve had since 2010 to customers, it is easy to say that I’ve had, literally, hundreds of conversations. Just do the math. It’s just impressive to reflect on that. Looking back at my posts about VCE since 2010 are telling. Even then I knew that every 6 months there would be something amazing happening. The challenge was of course to keep it on the down low and stay under the radar for as long as possible. In the time since my first posts I’ve learned a lot about what it takes to go from zero to a billion dollars in revenue. I know what that machine looks like and I know the passion, people, processes, and purpose it takes to crush all the records. Thousands of Vblock Systems are all around the world now. I still remember the day we crossed over there being more Vblock Systems commissioned than we had employees globally. That kind of growth isn’t something many people ever get to experience in their careers. I did and for that I’m incredibly thankful. Sometimes I tell stories about what I think is next. Sometimes I am lucky enough to do that while a camera is recording it. Let’s see how well my answers hold up over time. Ideally, I’d like to think I can continue these yearly updates and look back on them and reflect. The funny thing is that I haven’t really done that with the prior posts. In fact, my only other posts this year were on topics that have no direct correlation to VCE. My VCE blogging shifted to more internal stories that are behind the firewall within VCE and across our investor portals. My posts were for a rapidly growing organization. My posts were to capture much of the tribal knowledge in a formal way and explain my point of view and my view of the future. 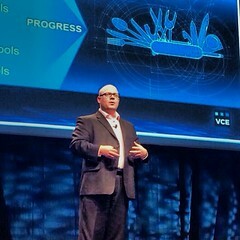 When I started at VCE there were some accomplishments I had in mind. Ubiquitous workload substrates were how I framed it back then. The goal was big, hairy, and audacious or whatever you call those crazy bars you set to get motivated to do something big. When I think about the biggest take away from all of this work so far I think it is still just a beginning. Sometimes it isn’t that you are going to make a dent in the universe but you have to get a running start before you run into something. If I was to put the past 12 months into perspective the theme would be about finding balance in the work / life mix. The mythical sirens are calling you back to the repositories and the demands are nonstop. That said, we aren’t a company of a few dozen people these days. We are a global workforce with a purpose and a mission to transform the data center. You get to see people step up now. You get to see people rewarded. You get to see people move on in their lives and careers. It isn’t the same crazy as when we started but it is still pretty crazy but just in a larger more global way. Seeing each investor explore adjacent markets and expand what they offer is intoxicating. Knowing that +22 Billion dollars of research and development is on tap to craft, curate, and refine into the next big thing – or the next little thing – is probably one of the more odd things one can try to describe. Of course, the details in these posts are always light. That’s how this is done.